Note: This story appears in the current Spring/Summer 2016 issue of The Minnesota Score Magazine. Special to the blog. We Minnesotans have a complicated relationship with Joe Mauer. He entered our consciousness as a teenager at the dawn of the millennium, became a superstar in his 20s and perplexed us when his skills suddenly eroded in his 30s. In the end, Mauer has been pretty good to us, enduring it all with humility and class. In places like Minnesota we tend to claim ownership of our stars, especially the homegrown ones. They belong to us. Mauer has kept us at arm’s length and that’s frustrating. We’ve gotten glimpses: he roomed with teammate Justin Morneau as bachelor a decade ago, married a high school friend in 2012 and became the proud father of twin girls a year later, but Mauer remains elusive. As Mauer enters what appears to be the twilight of his career, that’s become his unforgivable sin; that and a contract that reads like a Powerball jackpot. If only Joe would show a little more fire and a made little less money. It’s time for us to set that aside and accept and appreciate Joe Mauer for who and what he’s been and is. In an age of reality TV, social media and cell phone videos, Mauer has never been touched by scandal or engaged in shameless self-promotion. He’s been a “normal” person. That may not be exciting, but, under the circumstances, it’s remarkable. All Mauer did as a schoolboy at Cretin-Derham Hall was win Gatorade National High School Player of the Year honors in football and baseball. We all face difficult decisions after graduation, but Mauer’s dilemma was slightly different: play quarterback at Florida State or sign with the Twins as the No. 1 overall pick in the 2001 draft. The Twins offered a $5 million signing bonus. Apparently, Florida State wasn’t able to match. As expected, Mauer quickly adapted to professional baseball and shot up the Twins minor league ladder, reaching The Show in 2004. After an injury riddled rookie year (a sign of things to come), he was solid in 2005 and primed for a run of greatness. At his peak from 2006-2009, Mauer hit .336, reached base at a .419 clip and slugged .496. In those four seasons, he won three batting titles, three Gold Gloves, appeared in three All Star Games and finished in the top six of the AL MVP balloting three times. The St. Paul native’s 2009 campaign might be the best in Twins history. Mauer won the sabermetrics Triple Crown (batting average, on-base percentage and slugging percentage), with a batting line of .365/.444/.587, while smacking a career high 28 homeruns. The result was a near unanimous selection as the American League’s Most Valuable Player. At age 27, he was entering the final year of his contract and the Twins were moving into Target Field. If life is about timing, Mauer’s couldn’t have been more perfect. The Twins triumphantly agreed to an eight-year, $184 million contract extension with their Hometown Hero. The masses rejoiced. Sorry New York, Boston and Los Angeles, Joe is staying home. You can’t have him. While he would never again approach his 2009 power numbers, Mauer hit .327, .287, .319 and .324 from 2010-2013, leading the league with a .416 on-base-percentage in 2012. Most of that was obscured by what took place in 2011. Expected to compete for a third straight division title, the Twins instead finished 63-99. Mauer suited up for just 82 games, missing many with a mysterious ailment known as bilateral leg weakness. With the new contract kicking in, nearly doubling his annual salary to $23 million, the public wasn’t in an understanding mood. They were irate and wanted Mauer to show them he was too. His trademark calm had suddenly become a liability. Since suffering a concussion late in the 2013 season and moving permanently to first base, Mauer’s production has nosedived. Over the past two seasons, the 6-time All Star has hit an uninspiring .270 with just 14 homeruns in over 1,100 plate appearances. 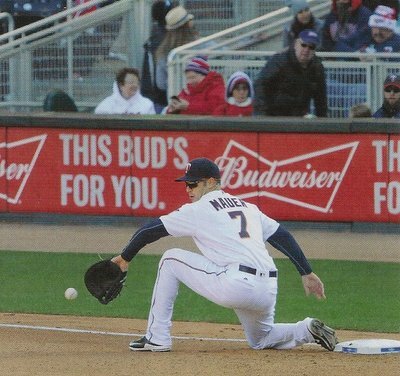 While his team took a leap toward respectability in 2015, Mauer established new lows with a .265 batting average and .338 on-base-percentage. There were a few positives; he suited up for a career high 158 games, hit .352 with runners in scoring position and, while the steak was mocked for containing more walks than hits, Mauer reached base in a Twins record 43-straight games late in the season. Prior to spring training this year, Mauer provided some insight on his recent struggles. The 33-year-old revealed that vision, particularly tracking the ball, has been an issue since the concussion. It’s hard to know what this information means; is it a reason for hope or sign of impending doom? For those of us in the anonymous world of manual labor, office cubicles and the service industry, it’s impossible to fathom what being Joe Mauer has been like. A local legend since puberty, he’s carried the hopes, dreams and, all too often, the anger of Twins Territory on his 6-5, 230 lb. frame. As the money, fame and exposure of professional sports has grown, the image of its participants has plummeted. Mauer seems unaffected by it. After more than a decade under the big league spotlight, he’s proven his wholesome image is legit. We’ve always looked for more, wanted more, but maybe we should have known all along: Joe Mauer is simply a nice guy.